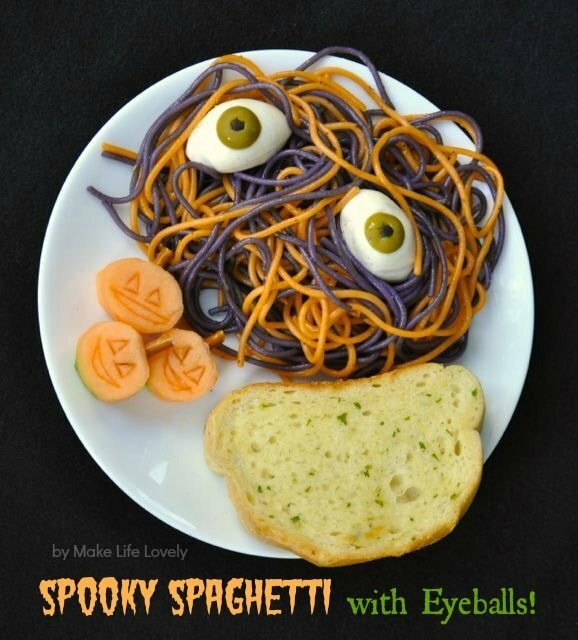 Halloween is absolutely one of my FAVORITE holidays and to celebrate I gathered together the creative minds of some of my talented blogging friends to bring you over 110 fabulous Halloween ideas! 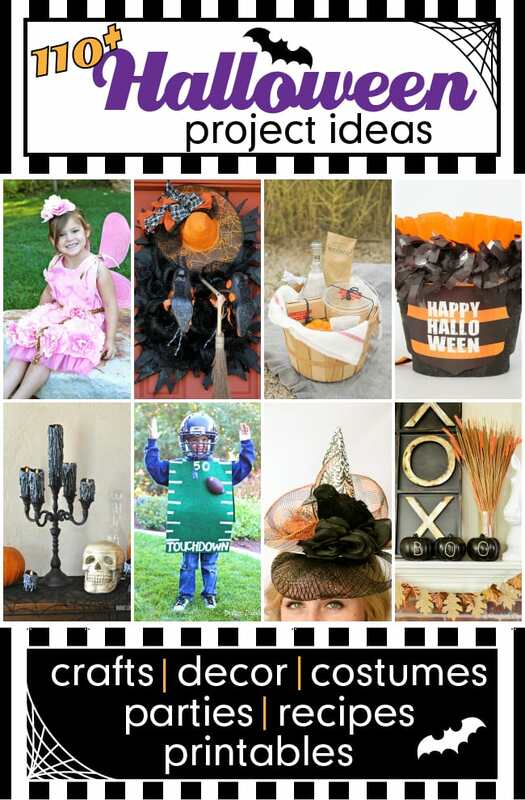 From costumes to parties, crafts and home decor, recipes and free printables, we have so many fun ideas to share! I guarantee you’ll find a project (or 10!) 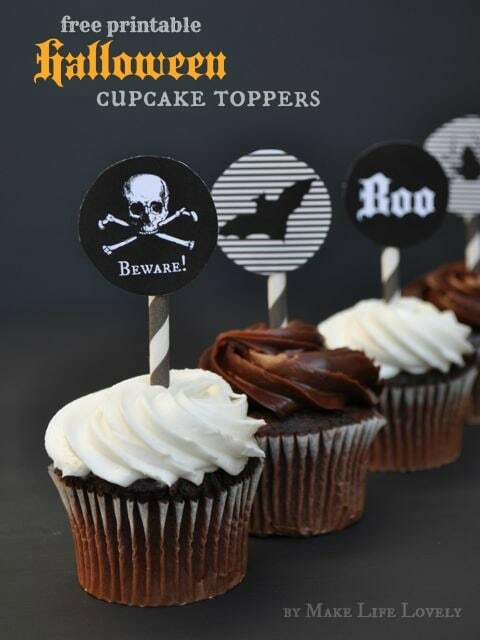 that you would love to incorporate into your Halloween festivities. All week (Monday through Saturday) myself and my blogging friends will be sharing our fun creations with all of you. 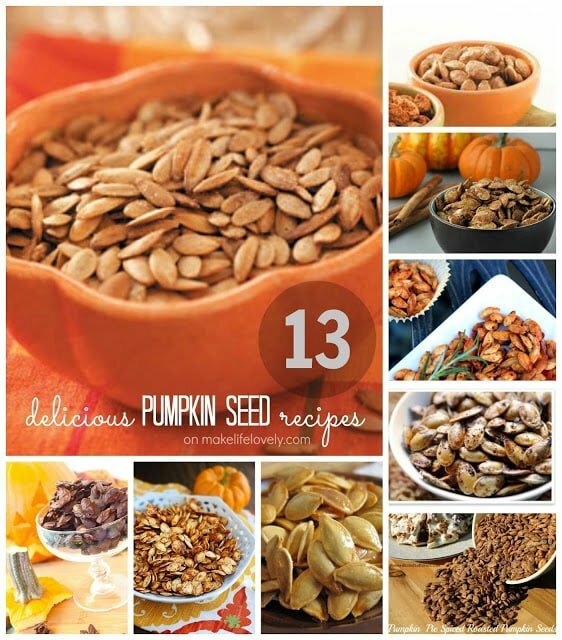 Each day will include approximately 20 Halloween projects and you can “hop” from one blog to another to check them all out. 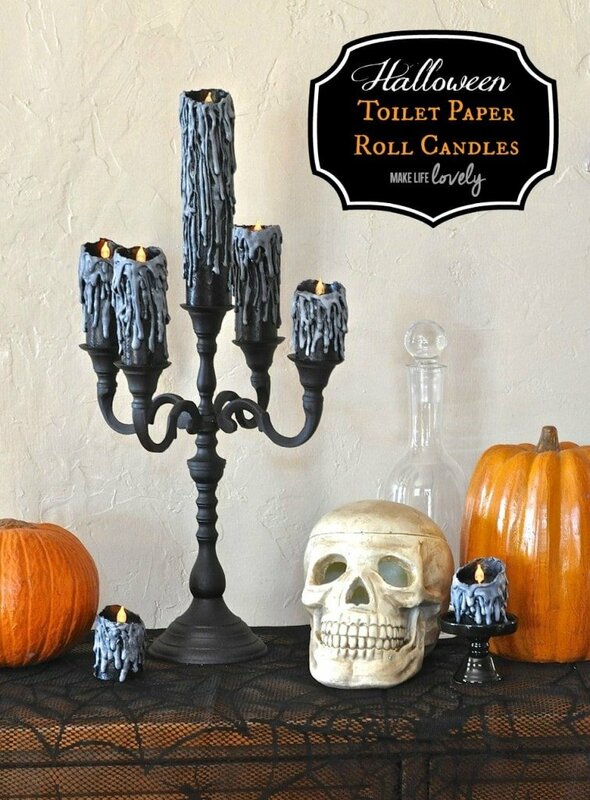 For my project, I’m sharing how to make these spooky Halloween toilet paper roll candles! 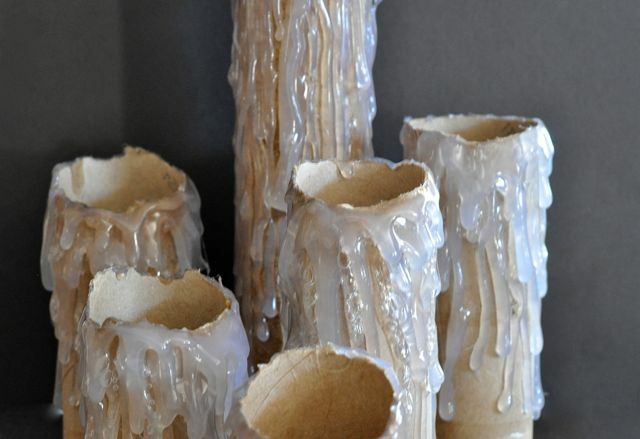 Did you know that you could make spooky, drippy toilet paper roll candles out of toilet paper rolls, a glue gun, LED tealights, and some paint?! These are really easy and are SO much fun to make! These were inspired by a set of candles from House of Dewberry. All 7 candles cost me just $4 to make, which I think is a great deal, considering just one wax-dripping Halloween candle will cost you more than that at the store. 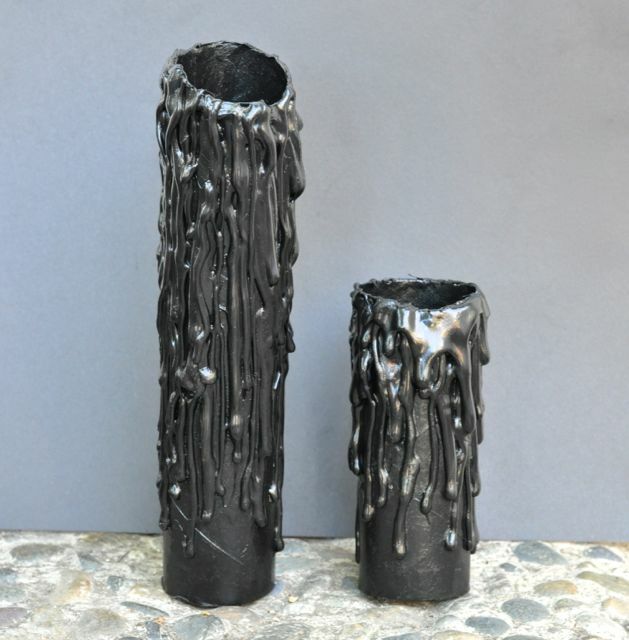 I love all of the layers of drips that look like old, crusted candle wax after being left to melt for hours. 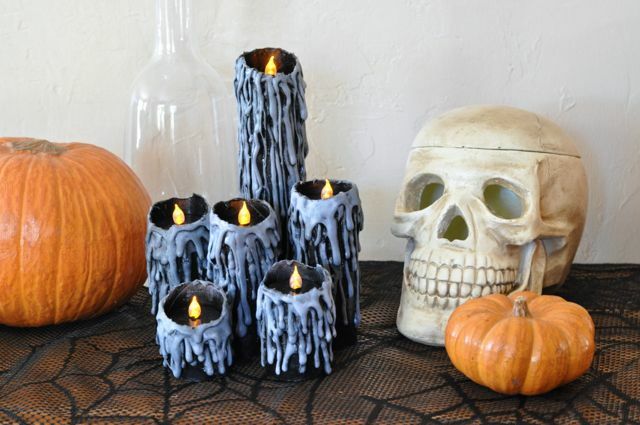 These candles make for great Halloween decor in your home, and are the perfect spooky decor for your Halloween parties too! Decide how tall you want each candle to be, and then use your fingers to tear the top of a toilet paper (or paper towel) roll to that height. I tore the front of the candle a little lower than the back of the candle so that you could see inside better. Carefully use your glue gun to create long strands of hot glue so that they look like candle wax. I started on one side and dripped all the way along the top, then went back and added longer drips, making sure that I didn’t let the wax drip onto my hand that was holding the roll. Let dry, and then add another layer. Repeat, adding as much wax as you would like to have on your candle, and repeat for each candle. 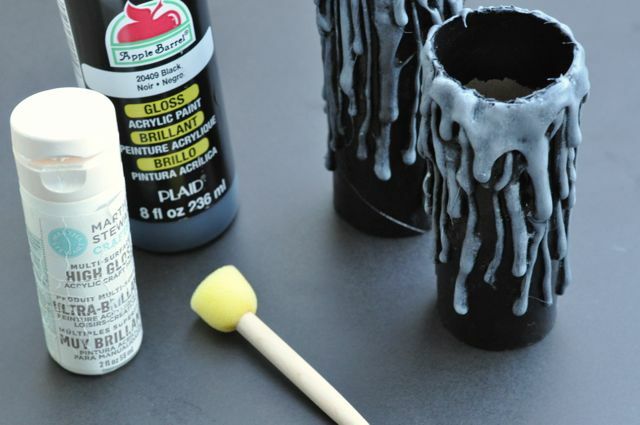 Once the glue is all dry, paint the whole outside of the candle and the dried glue with the black paint. A sponge brush worked really well for me to get into all the crevices made by the glue. Paint the first few inches of the top inside of the toilet paper roll, too, since those will be seen. Paint the top and sides of the LED tea lights black, making sure to leave the “flame” portion unpainted. The candle will look pretty good at this point, but I wanted the wax part to stand out a bit more. I added a little bit of white paint on my brush, mixed it with just a little bit of black, and lightly sponged the paint onto the wax. I love the way this part turned out! 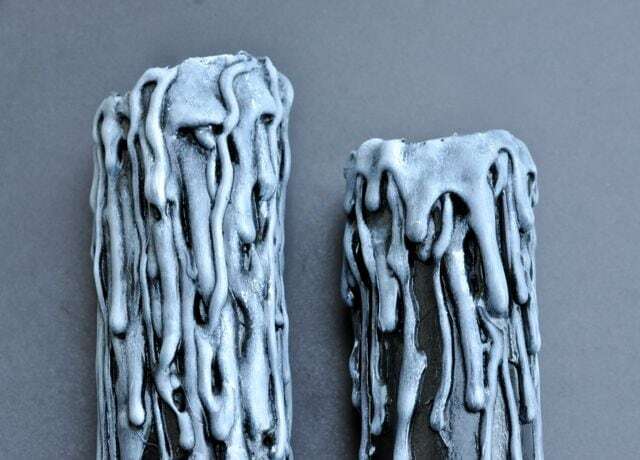 It made all the difference, because it helped the wax drips to stand out more so that it looked more like an old drippy candle. To make sure the candles stay inside the tops of the toilet paper rolls, I cut a piece of jute a few inches long for each roll. I carefully hot glued the jute into the top inside of each roll a few inches down, in a circle. The jute served as a kind of stand to hold the tea light in place. Forgot the picture of this one, sorry! Next I turned the LED tealights on and put them inside the toilet paper rolls. They looked SO cool!! I’m sure this goes without saying, but do NOT try this with regular tea light candles! You’ll start a fire real quick. Only use battery operated tea lights. This is one of those crafts that looks really complicated and difficult, but is super fun and easy to make. I hope you give them a try! I went a little crazy and made a whole set of candles in all different sizes. 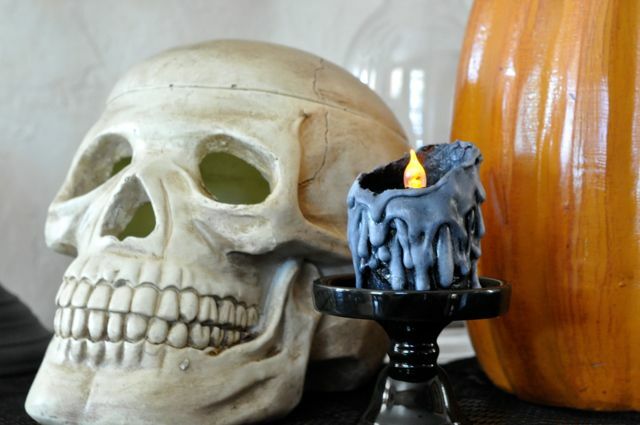 They look great with my World Market skull that I shared with you on my Halloween entertaining ideas post. 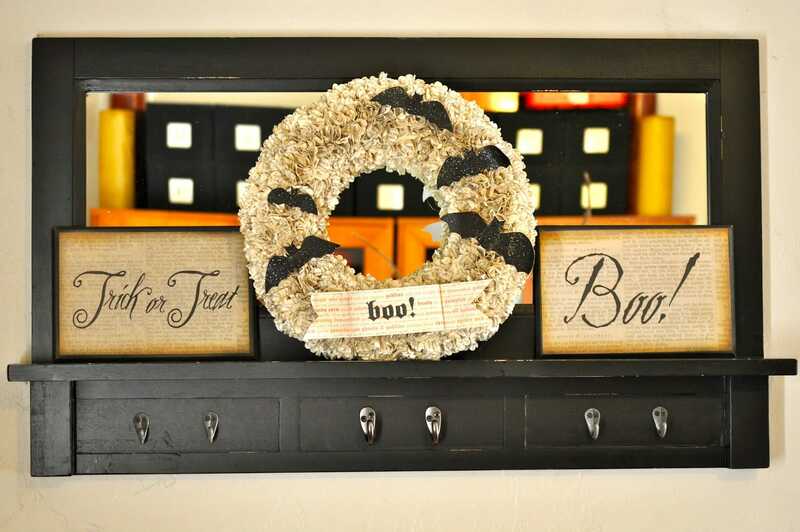 Here are some of my favorite Halloween projects that I think you’ll love! If you liked this post, I would love for you to follow me on Facebook, Pinterest, and Instagram. Thanks for following! Wow! These are so cool! Pinning! How FUN! Love your great ideas, thanks! Ha! great idea! Now I just have to remember to save those tp rolls. Pinning! So, so cool! I love this!